So this week in the Friday Roundup you will notice a couple of things that are different from the normal. First up it is a pretty short post! The reason is that the world is currently locked into the insanity of the whole Thanksgiving, Black Friday, Cyber-Monday thingy. Theoretically the main point of all of this I think is supposed to be the Thanksgiving part of it. Sadly if I look at the constant barrage of salesy emails and advertising I am getting right now, I can’t help but think the other two have completely taken over. The result of that is that most of my reliable and regular sources of content for the Roundup are currently heavily engaged in screwing every last dollar they can out of the moment! 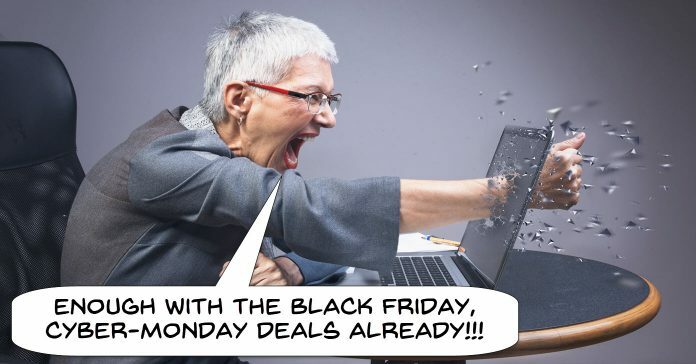 After observing the Black Friday/Cybermonday sales cycle for many years now one thing is very apparent. If you are in the market to buty something at this time of year just go to the maker’s website and get it there, the best discounts will be there and you will save a bunch of time which you could then spend with friends and family! OK, that’s it, my Black Friday / Cyber Monday sales pitch wrapped up for another year! Want a New Camera? DSLR? Know Your Options First! This is probably the best video of the week because it completely embodies how a blogger or vlogger should behave when it comes to crazy sales time! Yes, in this video Kevin is pitching for you to buy a camera and hopefully through his affiliate link! He does it by adding value and offering some really good advice when it comes to what camera you may be interested in for shooting videos. Well worth watching even if you aren’t in the market right now because it blows some modern camera myths out of the water. A lot of it is due to marketing, More Here. This is a tutorial done in Adobe After Effects and the gist of it is that you have a person as the subject appearing to act in normal time whilst at the same time everything in the background is running in fast motion. A few years back I would never have included a Premiere Pro tutorial on this site because it would have been pointless. The average person would not have been running software that could have in any way duplicated what was being done. Fortunately we now live in a brave new world of video editing at the consumer level and just about anyone could pull off this effect. There is usually more than one way to skin a cat when it comes to creating effects in video editing software. A lot of the pre-packaged transitions and effects you find in consumer brands are often just simplifications of what you could already do using the program’s settings. The reason they exist is to make things easier but on the other hand they are as I say, simplistic and often sacrifice control. The video below is a good example of manually doing what a transition does for you and the extra control you get. So we have Time Lapse and Hyper Lapse for shooting and editing videos to get some great effects but let’s not rest there! One of the unending mysteries of camera settings tends to be the ISO setting or in video cameras, the Gain setting. These days once you step out of the world of smart phone video capture you can exercise a great deal of control over the images you are getting beyond what you would have achieved by just using the automatic functions. A lot of people tend to stay way from these settings because let’s face it, they can be pretty daunting! If the ISO is set here then the aperture has to be here but if you do that then the shutter speed has to change which takes us back to the ISO and around we go! So check out this video below. It goes a long way towards giving you a stable point from which you can then launch into those manual settings and maybe get yourself some great footage.